Summer is birthday season at our house. With one child’s birthday at the beginning of summer and then three more within four weeks of each other later in the summer , we have a lot of cake and sugar floating around our house. So I am grateful for Big J for going with a lighter dessert for his birthday yesterday. He usually goes for the more non-traditional birthday desserts. 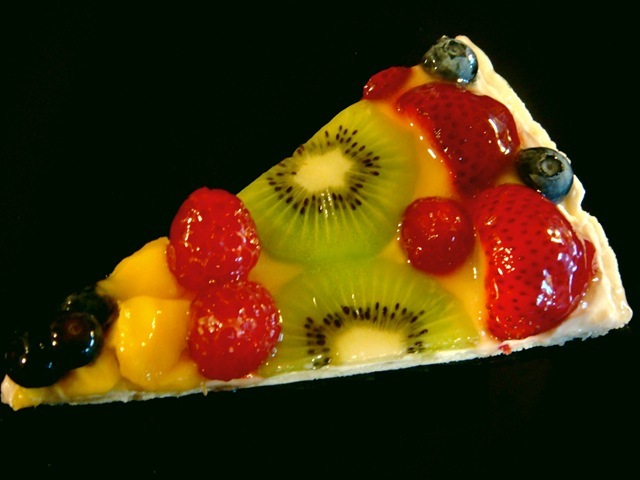 And with all of the fresh fruit available, I was really happy to make a Fruit Pizza. Eighteen Years! Eighteen years, in a land far, far away, my life changed forever. I can’t decide whether those 18 years have flown by, or that I’ve been a mom forever. Either way, it has been a wonderful journey. I love you J! It’s these coming years, as my babies slowly start leaving the nest that are making me nervous. 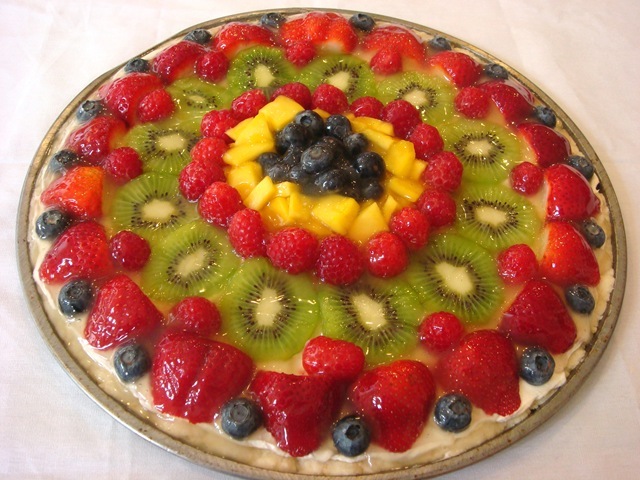 This Fruit Pizza has a shortbread crust, a thin layer of slightly sweetened cream cheese, luscious summer fruit, and a light glaze on top. The fruit I used, from the inside out: blueberries, mango, raspberries, kiwi and strawberries. The glaze is made from any light-colored fruit juice (I used a peach-mango, which turned out great! ), some sugar, cornstarch and lemon juice (to keep cut fruit from browning, especially if you are using bananas or peaches). Crust: Using a pastry blender, mix ½ cup powdered sugar, flour, salt, butter and ½ tsp vanilla. Press onto a pizza pan. Bake for 10-15 minutes. Cool completely. Filling: Combine cream cheese, 2 Tbs powdered sugar, and 1 tsp vanilla. Spread over cooled crust. 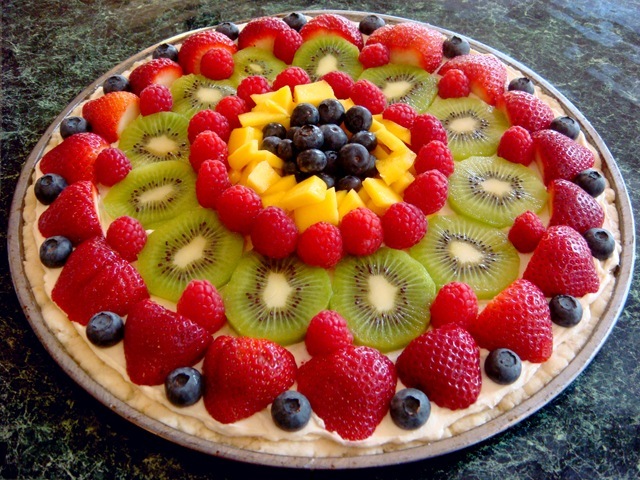 Arrange fruit on cream cheese layer. Glaze: Combine sugar, cornstarch, lemon juice and fruit juice in a small saucepan. Cook over medium heat until sugar is dissolved and mixture is thickened. Cool and spoon over fruit (all of the glaze may not be used). Chill. Slice into wedges to serve.